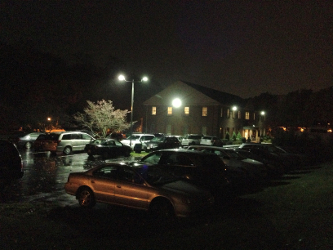 This week, more than 40 of our employees camped out overnight to ensure your funeral home had protection during Hurricane Sandy. While every lot in our office campus was empty on Monday night, as you can see from the photo to the left ASD's was filled almost to capacity. We are grateful to our staff of dedicated employees for staying overnight to ensure funeral homes on the East Coast had protection during Hurricane Sandy. This isn't the first time ASD has hosted a “Hurricane Sleepover” in order to provide support to funeral homes in affected areas and a safe refuge for our employees who live in flood prone areas. Last year, 44 ASD employees camped out during Hurricane Irene. ASD will always prepare in advance for major weather events like this because we know how crucial it is for your calls to be answered promptly and compassionately. Because we took this precautions, ASD operated at full capacity with no disruption of service during both of these storms. The day leading up to, the day of and the day after the hurricane we handled a total of 6356 more calls than the average timeframe. We did so while still answering 81% of those calls on the first ring and 98% by the fourth ring. We are proud to be able to protect our clients' reputations for excellence even during such troubling times. Everyone here is at a loss for words after seeing photos of the flood, wind and fire damage caused by Hurricane Sandy. To our friends in New Jersey and New York, we are keeping you all in our thoughts and prayers as you work to rebuild your communities. We realize that so many funeral homes are still without power in those areas and we have adjusted our staffing levels to ensure your calls will be answered without delay. Please let us know if there is anything else at all we can do to help. ASD was fortunate in that our area was not hit as hard as other places but our preparations were certainly necessary. Many roads in our community were shut down and local public transportation was shut down all day on Monday. Our location was chosen specifically because it is not located near any flood plains or low lying trees. However, not all of our employees are located in the safest areas so we maintain an open doorpolicy and provide accommodations so our staff and their families can stay overnight at ASD if necessary. This photo on the right was taken by the entrance to our office campus. As you can see, power lines were knocked out by Hurricane Sandy. Much of the area was without power and phone service. This is why ASD employees come to work during serious storms, instead of relying on staff to work remotely from home and hoping for the best. At ASD our power, phone lines and systems must keep running 24/7. We leave nothing to chance when protecting your phone calls. This is just one more thing that separates ASD from the 1,000 other answering services out there. Thank YOU Wayne for your kind words. We shared them with everyone on our staff.